The Faculty of Law was established as the fourth school at Matsuyama University in 1986 in response to the high expectation of local society. The Faculty has turned out numbers of excellent human resources to the business, official, and educational worlds. It cannot be overemphasized that the target of law education is the discipline of legal mind. The Faculty of Law attaches importance to the goal is not only fostering ‘Legal Mind’. 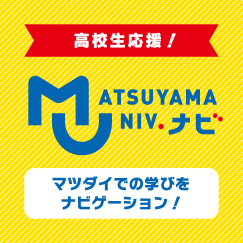 It also puts a special emphasis on the practical study, which is a tradition inherited from Matsuyama Koto Shogyo Gakko (Matsuyama Higher School of Commerce) as the origin of Matsuyama University, and aims at sending out human resources with a broad view in consideration of training students’ personality through liberal arts. The educational program in the Faculty is as follows. First, students must select and study 12 prerequisite subjects, such as the Constitution, Civil Code, and Politics, so that they study the specialized subjects systematically and efficiently. Second, on completion of the first year, each student is to choose a course from three selectable courses; Public Selection by learning basic knowledge, Corporate Legal Affairs, and Basic Legal Career. They can learn specialized subjects in any of these courses. Third, the Faculty takes into consideration that other subjects are indispensable to students learning law (e.g., subjects of accounting and management are indispensable to the learning of the Corporate Law and the Commercial Law). Therefore, students can learn a wide range of subjects of other faculties. Fourth, the Faculty attaches importance to the opportunity of detailed researches and discussions in small groups, with condition that all and senior students take a seminar with specialized subjects. Although it is optional, students can prepare for their graduation theses. The discipline of legal mind refers to not only making students memorize legal articles but also training them to become a person who can comprehend the actual aspects of the present world and make an adequate judgment from a wide viewpoint. The Faculty hopes that your young and flexible sensitivity and ambition.